We’d love your help. Let us know what’s wrong with this preview of The Works by Kate Ascher. Read Kate Ascher's posts on the Penguin Blog. Have you ever wondered how the water in your faucet gets there? Where your garbage goes? What the pipes under city streets do? How bananas from Ecuador get to your local market? Why radiators in apartment buildings clang? Using New York City as its point of refe Read Kate Ascher's posts on the Penguin Blog. To ask other readers questions about The Works, please sign up. Although this is a very New York specific book, in most of the chapters I could imagine parallels with cities I have lived in by stretching my imagination to traverse them as the book trolled the depths of New York. The last chapter titled “The Future” was the most eagerly anticipated. But it turned out to be a complete let down - being the most New York specific of all and almost exclusively focused on future plans (mostly construction/dev plans) scheduled in the city for the near future. While this is a (refreshing?) departure from wild predictions to be just focusing on pending innovations, it was also thereby less applicable outside the area focused on. The book entertained at times but in the end failed to deliver on the early promise that by understanding "The Works" of a sample city, it will teach me about how cities in general work and can be improved. 3 stars for that. [Yes, I am very unfair - it is actually such a meticulously researched, well presented and aesthetically pleasing book - almost a collectible to have in your shelf at home]. This book is brain candy for nerds who love to see how things work, and the best book of its sort that I can think of since David Macauley's book. Am only halfway through this but love love love this. Exactly the sort of thing the young geek I was would pore over for days and weeks. Great details and illustrations of subway systems, water mains, parking meters, and more--all the crap that we use everyday without remarking it. And full of such groovy little bits of information! (The different kind This book is brain candy for nerds who love to see how things work, and the best book of its sort that I can think of since David Macauley's book. Amazing read. With as many pictures as words, this book provides an incredibly detailed look into the systems of the city that go unnoticed. Ever wonder what those big steel canisters are on NYC sidewalks? Or how about why your radiator is "knocking"? This book has all that and much much more. Cities are, for my money, mankind's most astonishing invention. Their complexity is stupefying -- system within system, handling tons of material at any given time, whether the subject is cars across a bridge or the contents of a thousand home's flushing toilets. And the stakes are always high, with the health and happiness of millions on the line -- or at least, thousands. The Works is a dream of a book, a visual-rich guide to the many systems that keep cities thriving. Author Kate Ascher throw Cities are, for my money, mankind's most astonishing invention. Their complexity is stupefying -- system within system, handling tons of material at any given time, whether the subject is cars across a bridge or the contents of a thousand home's flushing toilets. And the stakes are always high, with the health and happiness of millions on the line -- or at least, thousands. The Works is a dream of a book, a visual-rich guide to the many systems that keep cities thriving. Author Kate Ascher throws light not on just the expected -- roads and utilities, say -- but also minor things like the postal service. Using New York City as case study, Ascher explores systems for transportation, energy, communication, and sanitation in turn. The Works stunned me again and again with its visuals. Readers are treated to an astonishing array of informative little diagrams: cutaways that show what's inside the Holland tunnel, for instance, or the underbelly of a street-sweeper, or the waterworks inside your average skyscraper. The pictures also demonstrate systems -- the chain of equipment required to convey power from a generating station into the average home, the links involved in a cell phone conversation, Some of the visuals are clever: for instance, to illustrate the variety of goods a train might carry, a cartoon representation of a real train runs along the bottom of every page in the chapter, each car marked with its contents. The same tactic is used to illustrate the electromagnetic spectrum in the chapter on communication. The bounty of visual information here is ludicrous -- showcasing fleets of sanitation vehicles and subway cars, mapping out train yards and container ship docks, -- it's staggering, really. Statistics are presented visually, too, and of course there are tons of maps -- including one that shows all the traffic cameras in the city. There are a few sample pages on Streetsblog, all from the chapter on streets. 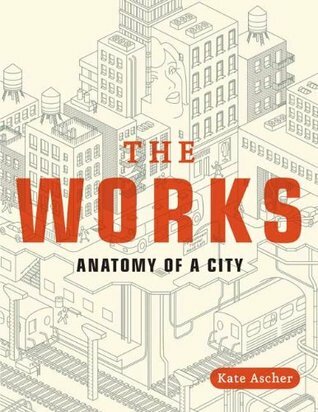 That's not to say The Works is merely a picture book, because there's no small amount of text here explaining the importance of all these systems, reviewing their evolution within New York City, and sharing the particulars of their operation. Reading this book is kind of like reading Gone Tomorrow, Picking Up, The Grid, Flushed! On the Grid, etc, all at once, all rolled into one, and with gobs and gobs and gobs of illustration. It does lack a chapter on the infrastructure of the internet, which isn't an oversight that would be made if it were published today. On The Grid: A Plot of Land, an Average Neighborhood, and the Systems that Make Our World Work, Scott Huler. Kind of like this but on a smaller scale with more detail and sans pictures. I really wanted to love Kate Ascher’s “The Works: Anatomy of a City.” I was looking forward to turning the pages with fascinated glee like I did as a kid with the anatomy and physiology textbooks and their transparent overlays of all the body’s systems. I had also hoped it would be something of a companion piece to Alan Weisman’s excellent “The World Without Us” — the former illustrating how we keep a city alive, the latter examining what happens when we’re not around to do so. Though meticulous I really wanted to love Kate Ascher’s “The Works: Anatomy of a City.” I was looking forward to turning the pages with fascinated glee like I did as a kid with the anatomy and physiology textbooks and their transparent overlays of all the body’s systems. I had also hoped it would be something of a companion piece to Alan Weisman’s excellent “The World Without Us” — the former illustrating how we keep a city alive, the latter examining what happens when we’re not around to do so. Though meticulously researched, wonderfully designed, and filled with hundreds of detailed illustrations, “The Works,” largely failed on all fronts. While abound in breadth, it is uniformly lacking in depth. While loaded with detail, there is no analysis of any of it. While its five sections — moving people, moving freight, power, communications, and sanitation — are perfectly delineated, each is discussed in a vacuum, and a look at how these systems work together would have been welcome. I absolutely loved this book, but that's not to say I'd recommend it to anyone. But for a certain type of dilettantish urban studies enthusiast (which I very much consider myself to be), this is an excellent and very entertaining read. Supremely digestible, pithy and loaded with helpful diagrams and winsome illustrations, Ascher walks us through every little idiosyncrasy, creative solution, and cludgey-workaround-made-custom to show us how New York City ticks. If you're someone who wonders how t I absolutely loved this book, but that's not to say I'd recommend it to anyone. But for a certain type of dilettantish urban studies enthusiast (which I very much consider myself to be), this is an excellent and very entertaining read. Supremely digestible, pithy and loaded with helpful diagrams and winsome illustrations, Ascher walks us through every little idiosyncrasy, creative solution, and cludgey-workaround-made-custom to show us how New York City ticks. If you're someone who wonders how things like subway signaling or waste disposal works and enjoy finding out, or if you're someone who enjoys finding out neat things that you never bothered to wonder about before (did you know that the top of the Empire State Building was originally designed to anchor dirigibles?! ), this book will delight you. And it is very NYC-heavy, but I would imagine it would apply in most cases to many large North American cities. I already have her next book, The Heights: Anatomy of a Skyscraper on order from the Brooklyn Public Library, and very excited for it. There is an abandoned subway station that I get to look at when I go to work each day, now that I know it's there. Garbage pickup for residents and businesses are done differently, even though it all goes to the same place. The mob used to own the garbage-collection-for-businesses. Rikers Island has a giant composting situation. Christmas trees are composted too. The walls of the automobile tunnels under the rivers get scrubbed every few days because they get really gross. Several Manhattan skyscrapers have their own zip codes! I found "The Works" to be an enjoyable read. It lives up to its title. Imagine an "Encyclopedia of the human body" with many cut-aways showing all of the internal organs using spectacular, 3D CGI diagrams and illustrations in full color. This book features plenty of those, and is indeed an unabridged "anatomy of a city". Author K. Ascher more than excels in demonstrating her intimate knowledge of how cities operate on a daily basis, using New York as its base. Mind-blowing trivia. I would, however, retitle it "The Works: Anatomy of New York City." It is great, it provides visuals and I like how it shows the composition of a city to the finest detail. It covers many aspects of a city. No quite as amazing as I thought it would be since it does fudge a bit on technical information. I found this an amazing book if you love discovering how things work, esp in a city like NYC. Strange to say, but it was a real page turner for me. First of all, very misleading name: I thought I was going to learn how to run a city, instead I learned that Maiden Lane was named so because maidens back in the old days drew water from wells along a stream that ran across the present street or something like that, though I do admit that learning this was quite pleasant. There were some interesting moments and information spread out through the pages, like Colonel George Waring (hats off to that guy) and the 1968 sanitation worker strikes (which First of all, very misleading name: I thought I was going to learn how to run a city, instead I learned that Maiden Lane was named so because maidens back in the old days drew water from wells along a stream that ran across the present street or something like that, though I do admit that learning this was quite pleasant. There were some interesting moments and information spread out through the pages, like Colonel George Waring (hats off to that guy) and the 1968 sanitation worker strikes (which wasn't mentioned in the book, but Waring's White Wings led me down a rabbit-hole). - You lose two stars for not diving deep enough into anything. I learned nothing at all about general urban infrastructure from the book itself. - You win one half a star back due to the amount of work that must have gone through the writing/illustrations. I suppose I am to blame for my disappointment, I should have evaluated the book better before starting to read. Un libretto molto interessante che descrive le infrastrutture tecnologiche che governano le città in generale, e New York in particolare. Parliamo di trasporto di persone e cose, fornitura di energia e acqua potabile, comunicazione tra le persone, pulizia di strade e case dai rifiuti. Il funzionamento delle cose è descritto molto succintamente, e viene fornita qualche cifra che dà conto degli ordini di grandezza in gioco. Il progetto editoriale trova un buon equilibrio tra infografiche e testo. C Un libretto molto interessante che descrive le infrastrutture tecnologiche che governano le città in generale, e New York in particolare. Parliamo di trasporto di persone e cose, fornitura di energia e acqua potabile, comunicazione tra le persone, pulizia di strade e case dai rifiuti. Consiglio questo libro a tutti coloro, grandi o piccini, che amano farsi spiegare come funzionano le cose. Ma anche agli altri: ritroverà con la lettura un rinnovato rispetto per chi lavora quotidianamente a renderci possibile la vita in città, che si tratti dell'ingegnere a capo di un acquedotto per milioni di persone o di un semplice netturbino. So so much of getting a city to run, a huge city that is, rotates about mud n' water with sticks holding it all up, and some sparks and fans for good measure. Published basically in the Stone Age, 2005, would be interesting to see what of the text's tail end projects have come to fruition and which have been provided a silent death by NIMBYs holding the head underneath the surface of water. Illustrations, charts, snippets, and insets galore. Wise decision to go heavy on the drawings, and leave pho So so much of getting a city to run, a huge city that is, rotates about mud n' water with sticks holding it all up, and some sparks and fans for good measure. This reads like a text book (and by the time I read it, a little out of date.) Do not be fooled; this is a book about New York City only. Would have been nice to have a page about New York City geography since it will be constantly referenced. But the writing is constantly assuming the reader know some things and the. Insulting you intelligence with other topics. Like yes I know how a phone works but how the hell is steam used as air conditioning. Everyone will learn something if they crack this This reads like a text book (and by the time I read it, a little out of date.) Do not be fooled; this is a book about New York City only. Would have been nice to have a page about New York City geography since it will be constantly referenced. But the writing is constantly assuming the reader know some things and the. Insulting you intelligence with other topics. Like yes I know how a phone works but how the hell is steam used as air conditioning. Everyone will learn something if they crack this book open, but it is inconsistent. It’s scary how vulnerable our infrastructure is, and how interdependent. Fun and broad look into various infrastructural systems of NYC, with beautiful illustrations. Pretty inspirational in terms of "wow, there's a lot of cool, complex, and meaningful systems I could be working on!" Sometimes the explanations get a little muddled or the numbers don't quite make sense but I'm willing to overlook that as the broad strokes seem fine. It does feel slightly outdated - left me wondering what the current state of all these systems is. Overall definitely worth the time - th Fun and broad look into various infrastructural systems of NYC, with beautiful illustrations. Pretty inspirational in terms of "wow, there's a lot of cool, complex, and meaningful systems I could be working on!" Sometimes the explanations get a little muddled or the numbers don't quite make sense but I'm willing to overlook that as the broad strokes seem fine. It does feel slightly outdated - left me wondering what the current state of all these systems is. A very interesting look at how city infrastructure works, and as a recent-ish transplant to the area, I'm glad that nyc was the example city. It's a good overview of a lot of different systems, and the illustrations and infographics were well designed and integrated. It's from 2005, so some things have progressed since its publishing-- the second avenue subway is in the Future section at the end of the book, and as I write this, it's going to start running tomorrow. Awesome. All about NYC. Couldn't believe how they get their water, how the communications systems worked... I worked with someone a few years back who was considering investing a large amount of money in a piece of glass to run from NYC to Chicago. The whole way. It's amazing how much infrastructure we use everyday, often without realizing it, often taking it for granted. This book highlights all of these oversights in a very clear and interesting way. some of the info is outdated (although it's kind of amazing how much isn't), but this is a fascinating read regardless. the historical tidbits are interesting, and the diagrams really do help you understand how things work. if you live in new york city and are curious about how your world works, i'd recommend this book. OMG I'VE BEEN READING THIS SO SLOWLY OVER THE PAST MANY MONTHS AND IT'S FINALLY DONE. In 2018, this book is a bit dated, but I still think it's a really interesting read! Ascher did a great job giving a comprehensive look at how cities work, and I thought the graphics were a great addition. I'll definitely be picking up her companion book about skyscrapers sometime soon! I enjoyed this book, but not as much as I was expecting to. Though I knew going in that it was a book about New York City, I was hoping that I would get a better perspective on how cities "work" in general. The subtitle "Anatomy of a City" led me to believe that this would provide me with a cross-section of a sample city that could then be applied to other cities. However, because New York is so unique (and old) I feel like its infrastructure is probably not a reliable comparison to many other c I enjoyed this book, but not as much as I was expecting to. Though I knew going in that it was a book about New York City, I was hoping that I would get a better perspective on how cities "work" in general. The subtitle "Anatomy of a City" led me to believe that this would provide me with a cross-section of a sample city that could then be applied to other cities. However, because New York is so unique (and old) I feel like its infrastructure is probably not a reliable comparison to many other cities. In short, what I hoped for was "anatomy of CITIES" but instead got the "anatomy of A city". That being said, I did find this book very interesting. The illustrations were superb and likely contributed more than the actual text. This is a book that can easily be flipped open to any page and immediately grab your attention. I certainly learned a ton. For example, I had no idea that NYC provides steam as a regular utility, the way other cities provide water or power (page 116). The section on the pneumatic tube mail system was also a pleasant surprise (page 136). I was also fascinated (and disgusted) by the section on sewage. It completely grosses me out that the city still dumps raw sewage into the harbor (page 174). I was a little disappointed by the depth of some of the information. I feel like the book did a really good job of providing a very broad overview of the aspects of city infrastructure, but in certain places I wanted it to go into more detail. What would have MADE this book is an illustration showing how ALL of these various elements of infrastructure are laid out together on a city block. I can imagine that between the subway, the water pipes, sewer pipes, steam pipes, electric lines, old pneumatic mail tubes, building substructures, etc., there isn't much room left for plain old mother earth. This is a book to bring joy to the heart of an engineer. Divided in five major sections - moving people, moving freight, power, communications, and sanitation - the book examines the infrastructure that keeps New York operating. Information is presented in a really appealing mix of maps, charts, cut-away diagrams, and some text. A sixth chapter, the future, notes that while most of the city's infrastructure systems developed separately, in the future more and more of these systems will be co-loc This is a book to bring joy to the heart of an engineer. Divided in five major sections - moving people, moving freight, power, communications, and sanitation - the book examines the infrastructure that keeps New York operating. Information is presented in a really appealing mix of maps, charts, cut-away diagrams, and some text. A sixth chapter, the future, notes that while most of the city's infrastructure systems developed separately, in the future more and more of these systems will be co-located and designed to directly support one another. One of the most informatively entertaining (and beautifully illustrated) books I've read in a long time. This is all about New York City's infrastructure but of course it could stand in for any city. The sheer complexity of moving people and freight, delivering power and water, and disposing of waste is really mind boggling, and equally amazing is how efficiently this book gets across this complexity in just a little over 200 pages. The book accomplishes this incredible informational feat by mixin One of the most informatively entertaining (and beautifully illustrated) books I've read in a long time. The book accomplishes this incredible informational feat by mixing text and illustrations---amazing (CAD?) illustrations that are just really polished. I mean really, this is infographics at its best. I'd say the book is 40% text and 60% pictures, and with every page spread is another chunk of facts about how cities are planned, designed, and maintained. Every facet of the city you can think of, and many that may not even occur to you, are explained and shown here in amazing detail. An unintended plus for me: after watching Law & Order for most of my life, I finally know where all the place names I've heard on the show are located. The East River vs the Hudson, the Holland Tunnel, the Bronx, Staten Island, on and on, now I can visualize where everything is! To keep from gushing about this book I'll just say this is a definite must read for anyone interested in the how-it-works, behind-the-scenes kind of information. Give this to any inquisitive kid for sure. I picked up this book because I wanted to learn more about the subway in NYC. I'm not normally a big consumer of nonfiction, but this book was a ton of fun to read. This is a large format book that would be at home on your coffee table or children's bookshelf. It's full of visuals, much like the beloved DK Eyewitness books. But make no mistake, this is aimed at an adult audience. It's packed with information about how things work in a city, from transportation (for people and freight), to power a I picked up this book because I wanted to learn more about the subway in NYC. I'm not normally a big consumer of nonfiction, but this book was a ton of fun to read. This is a large format book that would be at home on your coffee table or children's bookshelf. It's full of visuals, much like the beloved DK Eyewitness books. But make no mistake, this is aimed at an adult audience. It's packed with information about how things work in a city, from transportation (for people and freight), to power and communications, and even a section called "keeping it clean" which covers street cleaning, sewage, snow clearing, waste hauling, and recycling. Every time I wondered aloud "I wonder how...." it seemed to be covered on that page or the next. Want to know what lies under a manhole cover? How did they decide to designate "thru streets"? How are the subway tracks cleaned? How is air exchanged in a tunnel? How does a railroad yard operate? What is a combined sewer overflow? Does the mob really run NYC's waste business? All these questions and more can be answered in this book, which is presented in "nuggets" rather than one long narrative flow. The visual display of information is superb (I wasn't surprised to see Edward Tufte referenced in the acknowledgements). All in all, a delightful romp. I gobbled it up in a few days, though this would be perfect for dipping into on occasion. My only complaint is that the final chapter "The Future," is necessarily dated as this book was published in 2005. 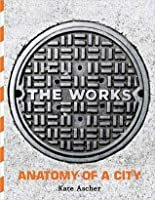 The Works: Anatomy of a City, by Kate Ascher, is a simple book detailing the inner workings of New York transportation, logistic and engineered infrastructure. The composition of New York's roads, sewers, traffic control methods, subways and trains, communication hubs and so on are all detailed with good chunks of information, and rich illustrations and diagrams. This is a really short read, with most pages containing large folio style illustrations, diagrams or charts with various tidbits of in The Works: Anatomy of a City, by Kate Ascher, is a simple book detailing the inner workings of New York transportation, logistic and engineered infrastructure. The composition of New York's roads, sewers, traffic control methods, subways and trains, communication hubs and so on are all detailed with good chunks of information, and rich illustrations and diagrams. This is a really short read, with most pages containing large folio style illustrations, diagrams or charts with various tidbits of information attached. It is, however, a very informative read about the inner workings of a large city with millions of inhabitants. How many of us stop to wonder what runs underneath those sewer grates we see, or how the traffic system in our city works? This book allows the reader to marvel at all the things we often take for granted. The quality of information in the book is good, but dated. The book was published about 10 years ago, so the number of computers running New York's traffic lights at the time (15) is probably a bit antiquated. In fact, a lot has probably been changed or updated to make room for digital technology. However, this is a very small criticism. The information in this book is relevant as ever, and even the antiquated facts are interesting from a historical perspective. Infrastructure. If this word doesn't dredge up even a slight bit of interest, do not read this book. It's a survey of all the bits of infrastructure that make New York City run (could be applied to any big city, but it focuses specifically on NYC). It's largely illustrations, with text explanations and descriptions. It will answer questions about how cities work that you, like me, may have always wondered in the back of your mind, like: how does water get to my faucet? What happens to sewage? Wh Infrastructure. If this word doesn't dredge up even a slight bit of interest, do not read this book. It's a survey of all the bits of infrastructure that make New York City run (could be applied to any big city, but it focuses specifically on NYC). It's largely illustrations, with text explanations and descriptions. It will answer questions about how cities work that you, like me, may have always wondered in the back of your mind, like: how does water get to my faucet? What happens to sewage? Where does all of our trash go? How does the cell phone network work? What about TV and radio? How did subway systems come about? How do all those bananas get from probably South America to the corner bodega on every corner of the city? Kate Ascher is an author and was executive vice president of the New York City Economic Development Corporation. Her 2005 book, The Works: Anatomy of a City, a textual and graphic exploration of how the complicated and often overlapping infrastructure of a modern city works, garnered wide discussion and praise when it was published. She left the NYCEDC in 2007 for Vornado Realty Trust. She formerl Kate Ascher is an author and was executive vice president of the New York City Economic Development Corporation. Her 2005 book, The Works: Anatomy of a City, a textual and graphic exploration of how the complicated and often overlapping infrastructure of a modern city works, garnered wide discussion and praise when it was published. She left the NYCEDC in 2007 for Vornado Realty Trust. She formerly held positions with the Port Authority of New York and New Jersey and in corporate finance. Ascher received her M.Sc. and Ph.D. in government from the London School of Economics and her B.A. in political science from Brown University.